Welcome to the 4th Good Beer Week in Melbourne, by far Australia's biggest celebration of what we all love; beer! Throughout the week there are over 200 beer related events for everyone from beginners to the most ardent beer connoisseur. I'll chuck the link to the main page here, if you're in Melbourne there's plenty of events you can still get tickets to and lots of tap takeovers that you can just rock up to for free and try some of the best craft beer that Australia, and the world, has to offer. I've already been to 4 events and the standard this year is even better than last year! The beer and cheese event I went to tonight was one of the best beer events I've been to! If you ever need cheese, go check out the guys at Milk the Cow, really knowledgeable staff and amazing cheese! Check out that event lineup! 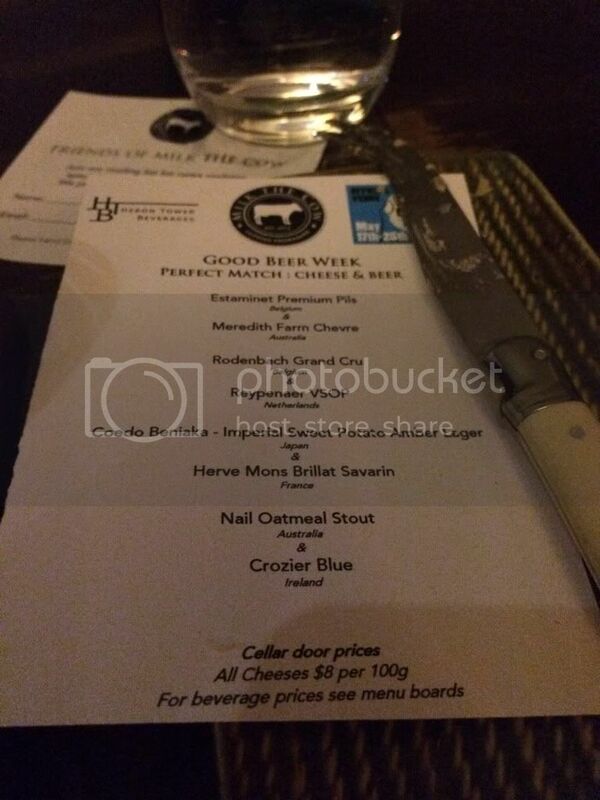 The Nail Stout and the Crozier Blue was one of the best cheese matches I can remember! As amazing as that sounds, the culmination and normally highlight of the week is GABS. It's a word (acronym?) that all Australian beer lovers know. GABS - The Great Australasian Beer SpecTAPular - is Australia's largest beer festival, with over 110 beers brewed specially for the event all by different brewers. If you like beer or know someone who likes beer, this is THE event not to miss! I've been speaking to a few people who like craft beer but have no idea what beers they would like at GABS - and that this is putting them off going. Don't let the fear of the unknown put you off - read Beer O'Clock Australia's round up of what GABS beers to drink, no matter what level of beer drinker you are. Yes, this years guide has a drinkability scale, but the Beer O'Clock wrap up will give you even more info and knowledge about the style of the beers/brewers and (hopefully) what you'll want to drink at GABS. There's only 4 sleeps left til GABS, so I better leave you guys with this if I'm going to get through my thoughts on all these beers. I'll divide the posts up into the 6 sections that you can order from at GABS for yours (and my) convenience. Hopefully some of you get some use out of it. Let me know your thoughts if you go and this helps you.